Knitter Danielle Landis established Worldwide Knit in Public Day to demonstrate that knitting is not just for women of a certain age—and there are plenty of people who agree with her! Girls and boys, women and men enjoy this relaxing and productive hobby. The fuzzy hats, cozy scarves, and warm sweaters that grow from two thin needles are amazing and are some of the best parts of winter. If you are a knitter, take your yarn and needles out for the day. If you don’t yet know the skill of knitting, today’s a perfect time to start! “Listen to the legend of the crew that sailed the deep / aboard a tattered pirate ship they called the Rusty Heap.” These pirates were as fierce as they come, with a captain who took no guff and rag-tag mateys who went about their sailing, swabbing, eating, and looting with a song on their lips. Let’s take a listen: “We’re tougher than gristle and barnacle grit. / We heave, and we ho, and we swab, and we…KNIT!! !” Knit?? Image copyright Leslie Lammle, text copyright Diana Murray. Courtesy of us.macmillan.com. You bet! Ned loves to knit! But the captain not be feeling it. In fact, he put his peg foot down. “I won’t be hearing that! / A scurvy pirate doesn’t knit, nor wear a fuzzy hat.” There was no time for knit-picking though; the crew was ready to do some looting. They rowed the dinghy out to an island and started to dig. And lo and behold, they uncovered chests of gold. While the rest of the pirates danced and sang about their good fortune, though, Ned leaned back against a tree and continued working on his knitting. That night the galley was alive with great cheer as the pirates celebrated. “We’re pirates, we’re pirates, out sailing the sea, / as scary and hairy as any could be. / We’re grouchy and slouchy. We don’t ever quit! / We slurp, and we burp, and we gulp, and we…KNIT!! !” Arrrgh! The captain blew his top! He was so steamed “he turned as red as lobster stew.” But Ned wasn’t going to back down—until the captain threatened him with walking the plank. Sadly, Ned went back to his bunk and packed away his fuzzy hat, “his needles, his balls of yarn, and skull-trim applique. / He folded up his blanket with the jolly roger crest, / and stashed it with the knitted scarves, the mittens, and the rest.” In the middle of the night, the crew was awakened by an ominous splash, and the captain hollered for all hands on deck. There, just off the starboard side, they saw “the briny ocean beast, / who loved to snack on pirate ships—his favorite floating feast. / His tentacles were thick with slime, his eyes a ghastly yellow, / and cannonballs bounced off his sides as if his skin was Jell-O.” The beast was snacking on the ship’s sail when Ned hurried back to his bunk and pulled out his trunk. He readied the catapult and with a sproing whipped his knitted blanket straight at the beast. Diana Murray’s sea yarn is a fun addition to the pirate picture book genre with an original hero, a slimy nemesis, an ingenious solution, and a rollicking rhyme that weaves it all together. Ned, with his knitted tri-corn hat and fresh face is a bit of an outsider who sticks to his needles, despite the needling he gets. He makes for a good role model for kids who might be doubtful about showing their true likes and personalities in a group. Kids will love this book as a read-aloud and will want to join in on the pirate song. Young readers may even be inspired to learn to knit to make their own special cozy. Leslie Lammle’s briny deep is home to a crew of rakish pirates who among them boast bare feet, one eye patch, one wooden leg, a hook hand, and, of course, a shoulder-sitting parrot. Kids will love sitting around the table with the mates and captain as they dish up some grub, and laugh when the captain blows his top at Ned’s constant knitting. Lammle’s ocean beast is scaly and toothy, but not too scary for little ones, and kids will appreciate Ned’s quick thinking. Readers will enjoy following the mermaid and trying to predict what will happen next in the story. During a second read, kids will see that she was trying to warn the pirates all along. For kids who like pirate stories and crafts, Ned the Knitting Pirate will find a purl-fect spot on their bookshelves. 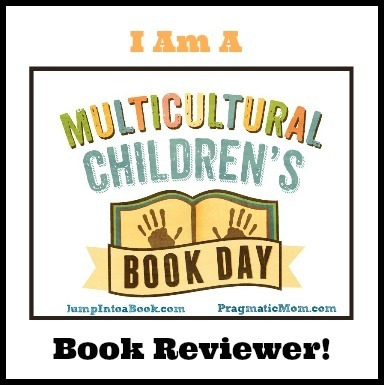 You’ll find more about Diana Murray and her books on her website! Check out a gallery of illustration work and books by Leslie Lammle on her website! Knitting is a fun and creative hobby! 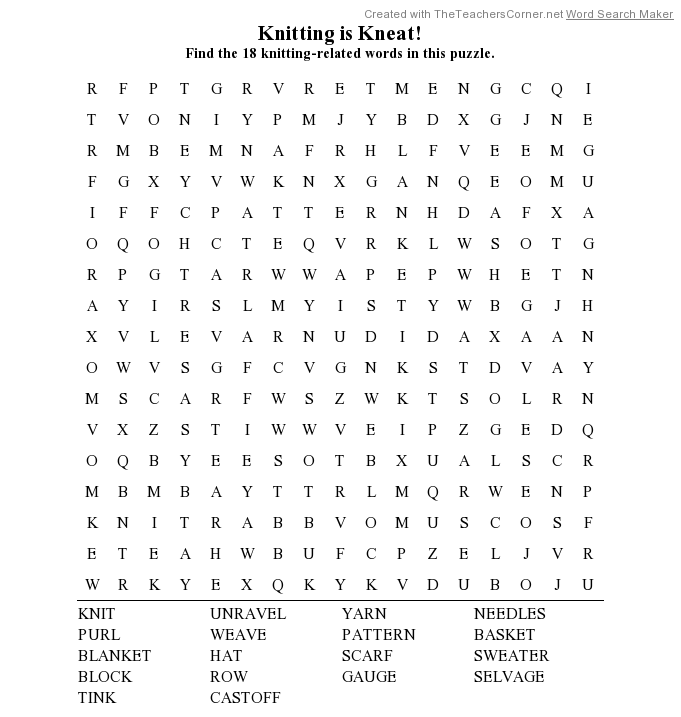 Can you find the eighteen knitting-related words in this printable Knitting is Kneat! 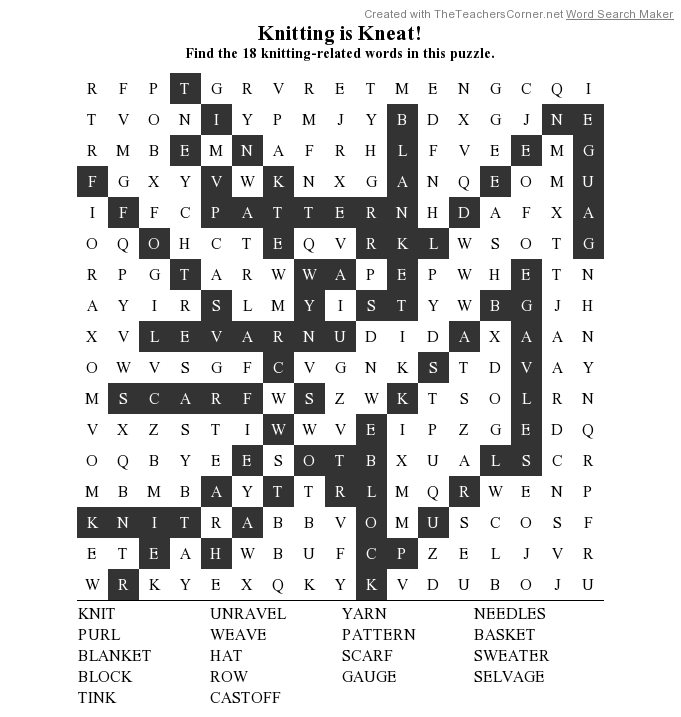 Word Search Puzzle? Here’s the Solution!